The Arch of Septimius Severus is dating back to 203 A.D wanted by Senatus Populus Que Romanus (SPQR - the Senate and People of Rome). The reliefs celebrate the victories of Septimius Severus over the Parthians (current population of 'Iraq and Iran) and Arabia (Mesopotamia). It is made by 3 ‘fornices’ (Strings), with a central passage flanked by two smaller side passages used by pedestrians. The arch is 23 meters high, 25 meters wide and 11.85 deep, and is made of marble. On the long sides of the attic (rectangular part above the arch) there is an inscription with a dedication to Septimius Severus and his son Caracalla. 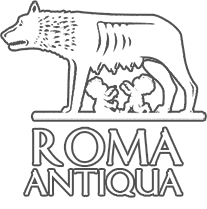 Originally, in the inscription there were writings celebrating both sons of Septimius Severus: Geta and Caracalla. But when Caracalla was elected emperor, he killed his brother Geta and took his name from the honorary inscription. Above the smaller arches with four panels decorated in relief, are told the phases and key events of the battle and the conquest of Parthia (Iran). They must be read and interpreted from the bottom upwards. 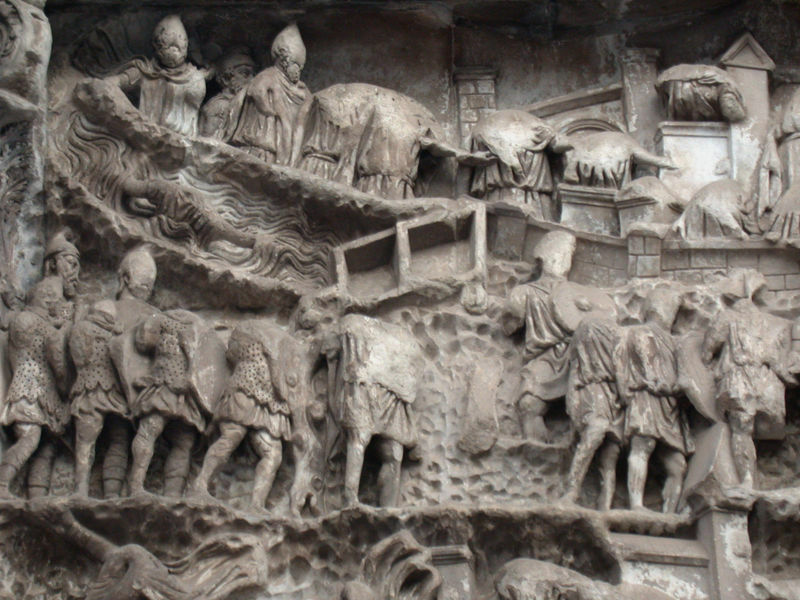 Above the central arch there was a ‘quadriga’ (chariot drawn by four horses) with bronze statues of Septimius Severus and his son Caracalla. A curiosity that dates back to the Middle Ages is that the bow was half buried and within a central arch a barber had set up his shop. Next to the arch, on the smaller side, it was been built a tower belonging to the Brachis family. The presence of a large number of cows and barns of animals and towers meant that the area was known as the Vaccine Field or Field Torrecchiano. Only in 1803, Pope Pius VII began to dig up the arch but it came up to light only in 1898. A copy of the arch of Septimius Severus characterizes the entrance of the Imperial Palace in Berlin. 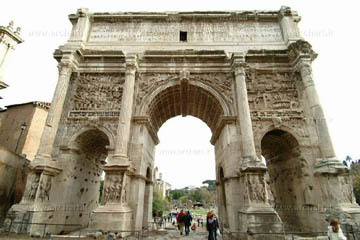 The arch is the only structure still intact in the Roman Forum.